Cornell Cooperative Extension of Oswego County is pleased to once again offer basket weaving at the Amboy 4-H Environmental Education Center. Inspiration by Linda Scherz Allen. On August 19 from 9 a.m. to 4 p.m., Linda Scherz Allen will lead a hands-on workshop in miniature basket weaving as part of the center’s Nature Inspires series. Allen has been creating baskets since her first 6” melon basket in the late 1980s. Little did she know how that first basket would change her life. Her love of weaving quickly expanded to designing, teaching, exhibiting, and entering juried shows. In 1990 she opened a shop, Adirondack Basketry, in her home, has branched out to work with an artists’ co-op selling her baskets, and in 2004 added an online shop. Allen teaches throughout the eastern United States for various guilds, conferences, art centers, and organization and enjoys sharing her basketry knowledge and experience with others. 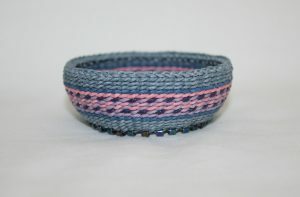 During this workshop, program participants will create their own miniature basket, Inspiration, woven with waxed linen. Inspiration is a great basket to learn twining with waxed linen, a beaded foot, and braided rim. 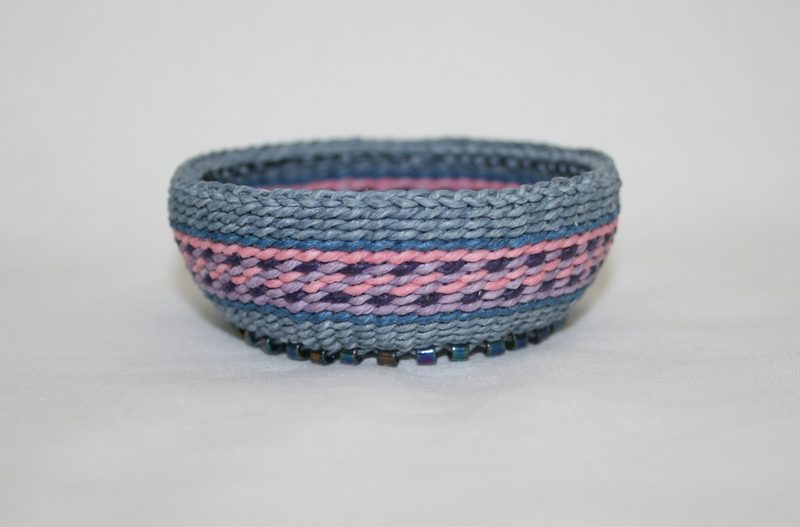 Techniques include twining, completing a row, setting up for next row, color change and how to make the pattern spiral, and a double braided rim. She will demonstrate and teach all the techniques to make your basket. Waxed linen is gentle on the hands; it’s always ready for travel and relaxing to weave. The basket can be made in different colors. The program fee for this artistic workshop is $4 per person plus $21 for the basket supplies. All tools and other supplies are provided. Participants should bring their own lunch and beverages. Registration, including payment of the $25 in advance, is required as space is limited. To register for this program, please contact the 4-H Office at Cornell Cooperative Extension of Oswego at 963-7286 before mailing your program fee. This Nature Inspires series is made possible with funds from the Decentralization Program, a regrant program of the New York State Council on the Arts with the support of Governor Andrew Cuomo and the New York Legislature and administered by CNY Arts. Please contact the office if you have any special needs.